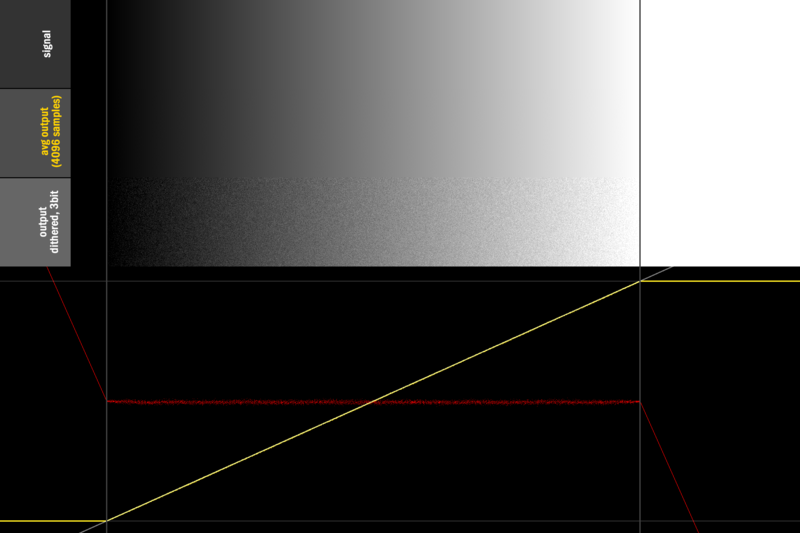 When reducing color depth and dithering with a 2 bit noise (with n=]0.5,1.5[ and output=floor(input*(2^bits-1) + n)), the ends of the value range (inputs 0.0 and 1.0) are noisy. It would be desirable to have them to be solid color. The problem can be of course solved by just compressing the value range so that the ends get always rounded to single values. This feels bit of a hack though, and I'm wondering if there's a way to implement this "properly"? TL;DR: 2*1LSB triangular-pdf dithering breaks in edgecases at 0 and 1 due to clamping. A solution is to lerp to a 1bit uniform dither in those edgecases. - essentially what hotmultimedia showed. 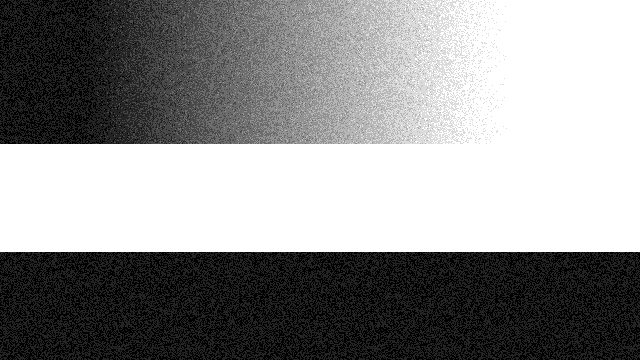 Increasing contrast, the effect described in the question becomes apparent: The output does not average to black/white in the edgecases (and actually extends well beyond 0/1 before doing so). 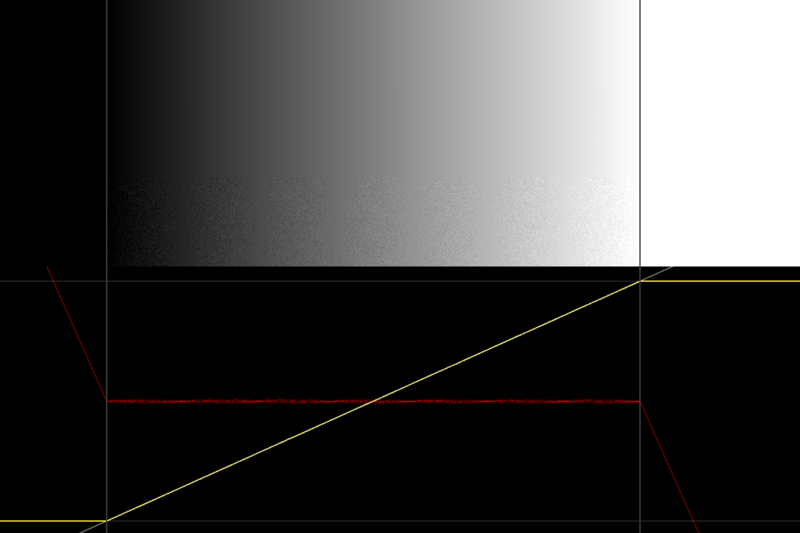 (grey lines mark 0/1, also in grey is the signal we are trying to output, yellow-line is average of dithered/quantized output, red is the error (signal-average)). Now, if we just use a 1LSB normalized dither, there are no issues at the edges-cases at all, but then of course we lose the nice properties of triangular dithering (see e.g. this presentation). So to not answer your question: I do not know if there is a more mathematically solid solution, and am equally keen to know what Masters of Past have done :) Until then, at least we have this horrific hack to keep our code functioning. First, the foundation of the question is a bit unclear to me: Why do you consider it desirable to have clean black/white when every other color has noise? The ideal result after dithering is your original signal with entirely uniform noise. If black and white are different, your noise becomes signal-dependant (which might be fine though, since it happens where colors are clamped anyway). // Dithers and quantizes color value c in [0, 1] to the given color depth. // It's expected that rng contains a uniform random variable on [0, 1]. 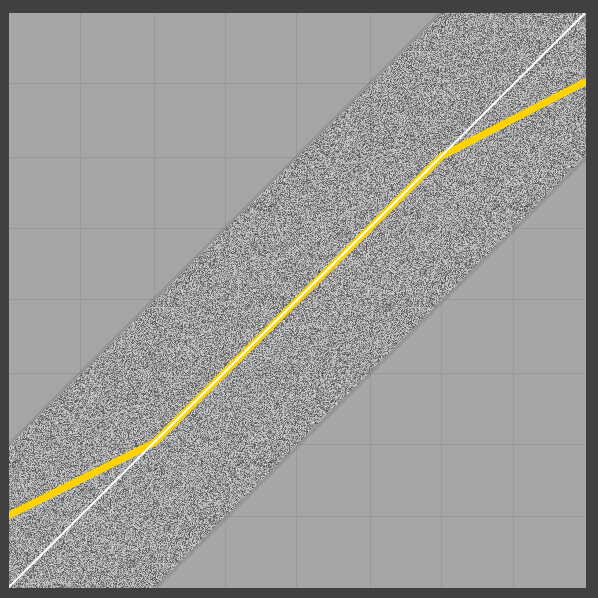 // Uniform distribution on [-0.5, 0.5] for edges. // Symmetric triangular distribution on [-1, 1]. For the idea and context I'll refer you to Mikkel Gjoel's answer. orlp is a new contributor to this site. Take care in asking for clarification, commenting, and answering. Check out our Code of Conduct. Not the answer you're looking for? Browse other questions tagged image-processing noise or ask your own question. Is all grid based noise inevitably anisotropic?